I was scrolling through TechCrunch and noticed an article on their site titled "The Mess on Wall Street: Four Trillion Dollars Down the Drain." The article linked to a New York Times graphic that illustrated just how far 29 selected financial firms have fallen over the past 11 months. The article goes on to say that the entire stock market had lost approximately $4 trillion dollars in market cap during that time period, and that the financial sector had accounted for a whopping one trillion dollars of that total loss. These were supposed to be the blue-chip companies that never faltered, no matter how weak the economy was. These were the companies that, conspiracy theorists opined, "controlled everything that took place, and everything was to their benefit." These were some of the biggest and most storied companies in the history of the United States. Some of these companies are gone, never to return. Some went bankrupt. 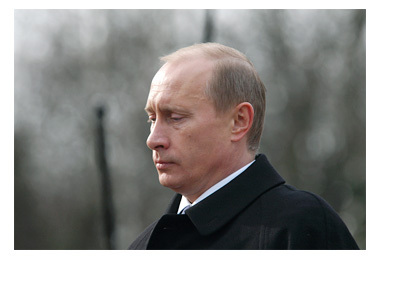 Some were swallowed up by the US government in a desperate bid to prop up the entire financial system. Some, while still breathing, are clearly on life support. Others are still alive and kicking, but have dropped many billions of dollars in market capitalization. The graphic can be found here. 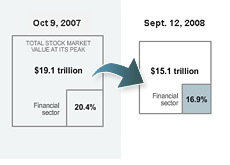 You can see that the New York Times took the market capitalization of 29 "selected financial firms" from October 9th, 2007, and compared it to their market caps on September 12th, 2008. As you can see, these 29 companies had a combined market cap of $1.86 trillion dollars on October 9th, 2007. Just 11 short months later, the combined market capitalization was less than a trillion dollars ($0.98 trillion dollars). I would also like to point out that the combined market capitalizations are significantly lower on September 18th compared to September 12th, when this graph was created. JP Morgan had a market cap of $142.2 billion dollars on September 12th. As of the close of trading on September 17th, that number was down to $123 billion dollars. Citigroup - $97.8 billion dollar market cap on September 12th. Close of trading on Sept. 17th? $76.4 billion. Goldman Sachs - $61.3 billion dollar market cap on September 12th. Just five days later? $45.9 billion. Wachovia - $30.8 billion dollar market cap at the close of trading on September 12th. Five days later? $19.48 billion dollars. You get the picture. You can walk down the list of the 29 companies and find similar drops. Even Lehman Brothers, which had a paltry $3.5 billion dollar market cap before the weekend, has seen its market cap shrink to just under $90 MILLION dollars after filing for bankruptcy. I would guess that the total market capitalization of these 29 companies has dropped to around $800 billion dollars over the last three business days, which is an absolutely mind-blowing loss. It will be interesting to see where these companies go from here. Can companies like Goldman Sachs and JP Morgan really continue to slip into the dark abyss, or will there be some sort of a cataclysmic bottom put in soon?